Pinter plays can be a frustrating experience, the infamous pauses, the obtuse writing, it can be a fascinating evening but also a frustrating one if executed poorly. Of course there was no real fear of poor execution from two masters of the stage in Patrick Stewart and Ian McKellan. Their double act, supported by fine work from Owen Teale and Damien Molony lifts this more obscure Pinter into something accessible and enjoyable for even the most Pinter-wary. It is an atmospheric production, with projections of trees reaching beyond the imposing living room set, and a soundscape of birdsong. Stephen Brimson Lewis through his set design gives an imposing presence to the house that Patrick Stewart’s Hirst inhabits. With high walled rooms and huge windows that are left curtained for much of the time, to the wing backed armchairs and hard wooden seats, Hirst’s world is drawn around him. The costumes too, also by Brimson Lewis, serve to create this particular slice of the world. Stewart clad in sharp pinstripe suits in contrast to McKellan’s Spooner, whose baggy suit has seen better days, his flat cap and tennis shoes likewise. Meanwhile Foster (Molony) and Briggs (Teale) sport a fetching line in extreme 70s suits. And with their outfits a particular corner of England is created. The costuming lends itself to the theme of nostalgia, the harking back to something now missing for both characters, for different reasons. Combining nostalgia with Cricket-both main characters are named for famous cricketers-ties with Pinter’s own feelings linking cricket to a time now lost. And this is something both characters are searching for, as is the younger Foster, who years for his earlier youth spent travelling in Asia, showing nostalgia is not only the preserve of the older generation. There is a wistfulness about the play, and the liminal space it seems to occupy between night and day seems to add to this. The performances are, as you would expect, a masterclass of acting and stagecraft. 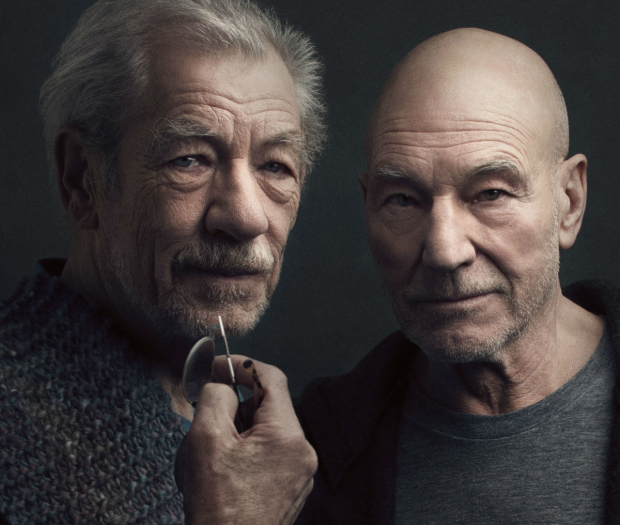 While inhabiting their own roles pitch perfectly, there is another level to this performance brought by the relationship between McKellan and Stewart. Playing off one another perfectly, and with performances so in sync the work could have been written for them, there is also a sense of real joy in the work that seems to undercut their performances. Individually they bring fascinating performances, McKellan’s Spooner is a loquacious and laconic poet, with a real air of vulnerability and confusion as he attempts to settle into his companion’s home. Stewart’s Hirst hides a different vulnerability behind a harder shell, and he is somewhat darker, harder to read. Together they have some joyously funny and touching moments in which both their skills as actors, and their relationship as actors (and friends) lifts to another level. It would be easy for Teale and Molony to be lost next to these two acting greats, but each holds their own and makes as strong an impression as the leading pair. An amusing and intriguing pair of sidekicks to Hirst, much is left unknown about the two employees who are brought to life with both comic timing and unanswered questions about where exactly they fit in. There are no answers, as you’d expect from Pinter. Instead we’re left with various questions: What is actually going on? what does the audience think is going on? what do the character’s think is going on? what does the playwright think is going on? ultimately it doesn’t matter if these match up, what matters is asking these questions. In the case of this performance, having reached them through a masterclass of stagecraft.